Previously unreleased live recordings by Zoot Sims from 1952 and 1960! Individually numbered limited edition - only 999 copies pressed! This Marshmallow release in its Historical Series features Zoot Sims' previously unreleased live performances from 1952 and 1960, both sourced from private recordings of radio broadcasts. The first four tunes are from 1960 and feature Sims' brother-in-tenors Al Cohn in front of a fabulous rhythm section of Mose Allison, Bill Crow and Nick Stabulous. The band swings like mad and are clearly having fun in this set. The quality of the recorded sound is also very good. The last three tracks are from 1952, and sourced from a super-rare acetate disc produced by the famous jazz archivist Boris Rose. (Marshmallow producer Mitsuo Johfu estimates there are probably only four or five copies left in the world.) As such, there is a lot of surface noise and the sound quality is poor. On these tracks, Sims--who was 27 years old at the time--joins the two-trombone group by Kai Winding and Bill Harris. 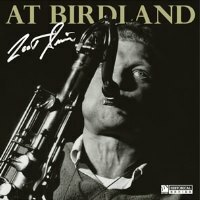 This is a fantastic release for fans of Zoot Sims! This is a vinyl LP version. The CD version is available here. Recorded from live broadcast from Birdland, New York, in 1952 (Tracks 5-7) and 1960 (Tracks 1-4). Mono.